As Co-Founder and CEO, Dippak Khurana is responsible for driving the vision and strategy of VMAX™. With an illustrious career that spans over two decades, he has spearheaded the Internet and mobile revolution in India. Post a successful stint in the desktop Internet industry, Dippak moved to the mobile industry in 2001 where he launched multiple market first initiatives for Yahoo! India and pioneered mobile Internet portals for telecom operators. 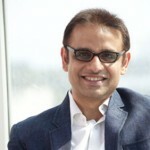 Dippak co-founded mobile marketing and commerce platform, Vserv in 2010. In 2015, he co-founded VMAX™ with the aim of solving the unmet challenges of app publishers. Today, VMAX™ has emerged as a preferred platform for eminent publishers and is a leading app monetization platform in India & Southeast Asia. Dippak has gained industry recognition as the Mobby’s ‘Mobile Professional of the Year’, Business Insider’s ‘Most important people in Mobile Advertising’ and features in India’s Digital Power 100 list. He is also a speaker/panel host in key events and prestigious international boards like GMIC, ad:tech, VCCircle, IAMAI, CII, Code/Mobile, MEF, amongst others. Dippak is regularly featured in top tier media like Forbes India, The Economic Times, Mint, CNBC, Businessworld, PandoDaily, VentureBeat and several other prominent Indian and international publications.